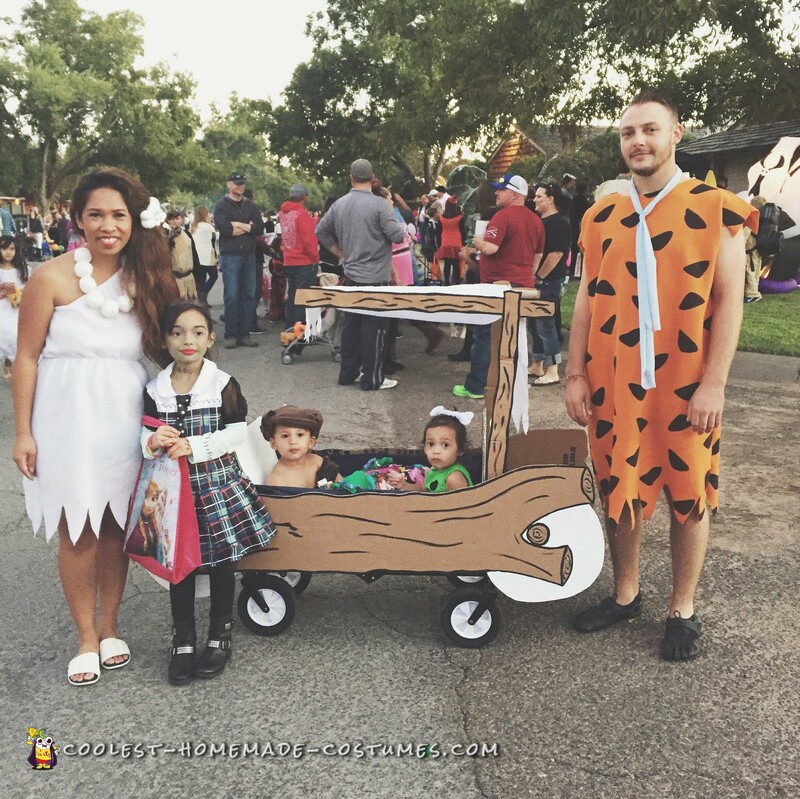 My daughter who is 6 was Pebbles for Halloween when she was two. I made her costume at the time and when we had twins boy and girl who are now two. I decided to hand my oldest costume to her and make my son Bamm Bamm and also created his costume. My husband and I dressed as Fred and Wilma but now Flintstones family I complete without a stone age car to hall two cuties around and so my husband made the car by cutting out a water heater box from my place of work. He just found a photo from google out of the cartoon and started from there. He placed two dowels in the wagon to old the roof, inserted wrapping paper rolls to the top of the dowels and cut a wire hanger to hold it in place. I cut the lengthy of the fabri to put on top and he then cut and painted two pieces of cardboard to place inside the wagon. He drew the wooden pieced and wheels onto the carboard box and painted it and adhere it to the wagon with Velcro. We were able to assemble the wagon to place it in our suburban. As we walked around with the wagon we were stop with oohs and awes and asked to take pictures.